Euston Road is our latest student development located in central Banger, comprising of 45 high specification studio apartments and 3 cluster bedrooms. Each unit features spacious combined kitchen and living areas, with premium finishes and furnishings throughout. Euston Road is perfectly located within close proximity to; Banger University, the train station and public shopping district. 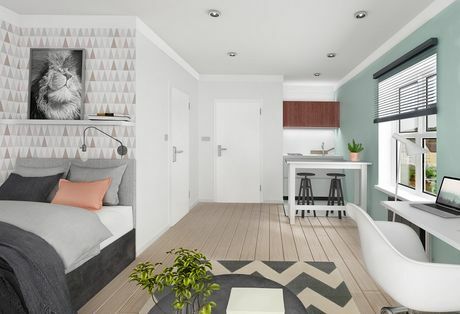 Meaning alongside having quick and easy access to the University, student residence has all Banger has to offer on their doorstep. Bangor University is rated amongst the top 10 universities in the UK for student satisfaction. Bangor University is a; friendly, convenient and student-centred place to study, with the size and friendly nature of the University being one of the main reasons many of our students choose to study here. Bangor alone is a picturesque location, however being located a short distance from Snowdonia National Park really sets the city apart. Bangor also benefits from direct train links to London, Manchester, Liverpool and Cardiff not to mention the direct ferry link to Dublin from the nearby port of Holyhead. This makes Bangor an extremely popular place with tourists, students and residence. For more information don’t hesitate to contact us on enquiries@hopwoodhouse.com or call +44 (0) 161 337 3890.